In this work, the hardware implementation of a noncoherent multichannel autocorrelation UWB receiver (AcR) is addressed. We focus on the multiplication device, which is a core part of the AcR and introduces strong interference due to nonlinear effects. To analyze the signal-to-interference ratio performance of the receiver system, a combined Wiener-Hammerstein system model of the multiplication device is introduced. It is shown that the receiver performance strongly depends on the input power of the nonideal multiplier devices. The figure illustrates the signal-to-interference-and-noise-ratio (SINR) of the decision variable of the AcR receiver. Due to nonlinear effects of the multiplier device, the SINR degrades strongly for increasing multiplier input power. 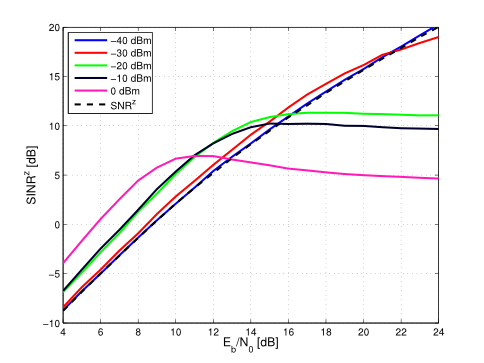 The system model proposed in the paper shows that the nonlinear terms introduced by the nonideal multiplier are additive, therefore additional postprocessing might be able to enhance the SINR and BER of the receiver system. For more information, please refer to our paper!